38R blue pinstripe 2 button bespoke tailored "Vicuna Wool blend" suit 33W x 29L. Inseam (crotch to cuff) 28.625" (1.75" to let out). Waist (laid flat) 16.75". Inseam (crotch to cuff) 29.125". Waist (laid flat) 16.50". Inseam (crotch to cuff) 29.25". Waist (laid flat) 16.75". Front Rise (waist to crotch). Shoulder (seam to seam) 19.00". Inseam (crotch to cuff) 29.00". Waist (laid flat) 16.75". Luigi Bianchi Sartoria Suit. Navy blue striped extrafine wool and silk fabric. 85% wool, 15% silk. TOP SHELF APPAREL. 29" (from bottom of collar) Length. Trim, tailored fit. Smooth woven hand. 29" ( 2" to let out) Inseam. Style is 2 button with dual vents and flat front pants with no cuff. Chest: 20 1/4 pit to pit. Rise: 10 3/4. Inseam: 29. Sleeves: 23.5 shoulder seam to cuff. Waist: 16 3/4 across. Vitale Barberis Canonico Italian Wool. Super 110s Wool. Sleeve Length (Shoulder seam straight down to end of cuff): 26”. Waist (laid flat, straight across): 17”. Pit-to-Pit: 21”. Shoulder Width: 18”. Length (bottom of collar to bottom of jacket: 30”. ). Calvin Klein 2 piece mens Slim Fit black suit. Jacket 38 Regular pants 33x29 ! This suit is in absolute amazing condition. No stains, tears, or distressed parts anywhere. 100% wool. Made in Canada. What more can you ask for?! Pants have been hemmed, but have a solid 2 inches that can be let out. Calvin Klein 2 piece mens Slim Fit black suit. Jacket 38 Regular pants 33x29 !. Condition is Pre-owned. Shipped with USPS Priority Mail. Front Rise (waist to crotch). Shoulder (seam to seam) 18.00". Inseam (crotch to cuff) 29.00" (2.50" to let out). Waist (laid flat) 16.375". Material -Tasmanian Super 130's Wool. Color - Gray. Inseam: 29". Waist: 33" (2" of extra let material = 35"). Pants: 33X29. Lining - Full Silky Lining. E. Sleeves - 24" (No extra material). D. Length - 31" (From bottom of collar). Length (BOC to hem) 28.50". Inseam (crotch to cuff) 29.00" (1.25" to let out). Waist (laid flat) 16.50". Appropriate to wear : Spring, Fall, Winter. Marked Size: 42 Regular. This suit is pre-owned, but was gently worn and is still in good condition. Sizes can vary depending on the style of the item, the manufacturer and the way the designer intended the item to fit. Color: Charcoal with white stripes. Fabric: 100% pure virgin wool (the world's best pure virgin wool mark). Style: 2 Buttons suit. This suit never been worn, but jacket was very wrinkled and i dry cleaned it. Subtle herringbone pattern in what feels like a traditional 100% wool construct, potentially a blend but not sure. Chest: 20”. Waist: 16.5”. Solid Black with fine shadow stripe tone n tone, 100% wool super 180's, made in Italy. Suit is pre-owned in excellent condition, coat's exterior pockets still factory sealed. Inseam 29" cuffs. And 29" length with 1/2" to let out if needed. Overall Length 30. Sleeves (From outer edge of shoulder to outer cuff of sleeve) 24, with 1" to let out. PANTS DETAIL Shoulders ( Across top of Shoulders). Inseam (crotch to cuff) 29.25". Waist (laid flat) 16.50". Shoulder Seam To Sleeve End. Base Of Collar To Bottom Of Coat. 25" (.5 "Let Out). I am always happy to work out any problems. 29.5" (Let Out)2". 16.5" (L/O 1). Pattern - Pinstripe. Pant Front - Pleated. Material - Wool. Color - Navy Blue. C. Jacket Waist - 42". Waist - 33" (With 1" to let out). Rear Vent(s) - None. D. Length - 31" (From bottom of collar). ONE BUTTON MISSING BACK TROUSER POCKET. OTHERWISE, BEAUTIFUL: NO STAINS OR FLAWS. MATERIAL IS 100% PURE WOOL, WITH FULL LINING. SI ZE IS 38 SHORT. THIS IS A VERY RECENT SUIT, MODERN, WITH FLAT FRONT PANTS. Amazing suit. 29" length in back from bottom of collar. another 2" can be let out of waist. another 2" can be let out of bottom. Inseam (crotch to cuff) 29.00". Waist (laid flat) 16.75". Top to bottom: 33". Waist: 33". Pit to pit: 22". Back: Shoulder seam to shoulder seam: 19". Across Top Button: 20". 40R 22 31.5 24.5 2.5 18.5 33 3.5 29.5 1 Cuffs. Shoulder Width. before placing your order. Hem Length. Inseam (crotch to cuff) 28.875 (2.50)". Waist (laid flat) 16.625". Hart Schaffner Marx. Size: 40R, 33"X 29". Armpit to armpit: 20.5"Sleeve length: 23" Shoulder to hem: 29". Two-Button Closure. A great looking suit from Hart Schaffner & Marx. Suit is made from a four season weight 100% Wool, a fine weave and smooth finish cloth. 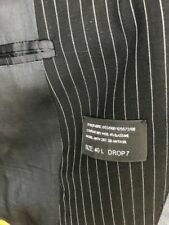 Color is navy blue with a gray pinstripe. Perfect condition. Tommy Hilfiger. Pattern: Pin Stripe. Size: 41 R. A Classic Pattern. Color: Gray. Jacket,2 Button, Rear Vent. 24" sleeves shoulder to cuff. amazing suit. labeled 40 reg. another 1" can be let out of waist. Inseam (crotch to cuff) 28.875" (2.125" to let out). Waist (laid flat) 16.75". Pants= 33x29. Jacket USA Size= 40R. Material= 100% Wool. Features= fully canvassed, Italian fabric, pick stitching. Length= 31" from bottom of collar at seam going down the back. Single vent. Material reserve= yes 2" in L & W.
Color : Brown. Four Interior Pockets. Four Faux Buttons on the cuffs. Two Button Single Breasted. Three Exterior Pockets. What good is a great deal if it's on a knockoff?. Maybe you're not a millionaire, but at least you can be just as well-dressed. Trouser Style: Pleated. Trouser Lining: Unlined. Trouser Waist: 33". Trouser Waist Outlet: 2.25". Trouser Seat: 22". Brace Buttons: Yes. Trouser Thigh: 13.5". Label: Ralph Lauren. Pants - Waist - 33.5" Inseam - 29.25". 2 button jacket w/ flat front pants ( no cuffs). Midnight dark blue (almost black) - I think it has to be a very dark blue since the lining is navy blue but I could be wrong. 100% worsted wool. Inseam: 28.5” (probably enough extra material to make 30”).